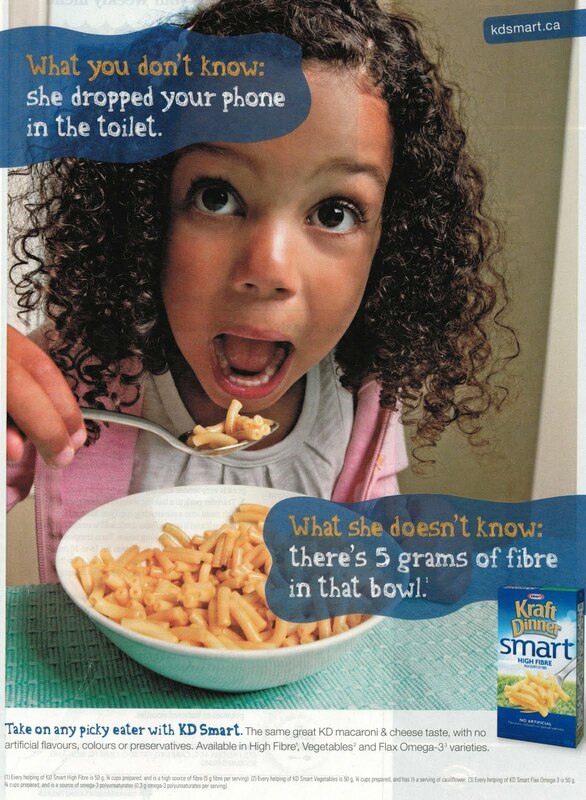 So does 5g of orphaned fibre make Kraft Dinner a nutritious choice? "Why did we create it? We know the dinner table can become a daily battleground between parents and picky eaters, especially when nutritious foods are involved. So we set out to make a new KD that kids would love to eat and parents would be proud to serve. KD Smart has added ingredients, contains no artificial flavours, colours or preservatives, and has the same cheesy taste that even the pickiest eaters can't resist." So it would seem that Kraft wants you to believe that KD Smart is a "nutritious food", and for good measure also invokes the natural fallacy to hammer that message home. So what do you get in a box of KD Smart? Refined white flour to which orphaned oat hulls, some inulin and a whole pile of salt are added. Ok, so it doesn't actually read "orphaned oat hulls" on the label, instead it reads "oat-hull fibre". I'd argue orphaned oat hulls would be more accurate as adding just the oat hull fibre does not convey the same nutritional benefits as actually eating whole grain oats that includes not only the hulls, but also the germs. And is 5g of fibre really brag worthy? It's less fibre than your child would get consuming a fruit with a peel, and less than they'd likely get eating a sandwich made with actual whole grain whole wheat flour. Sure, KD's definitely a North American rite of childhood passage, but "nutritious" and "Smart"? Not on your life.